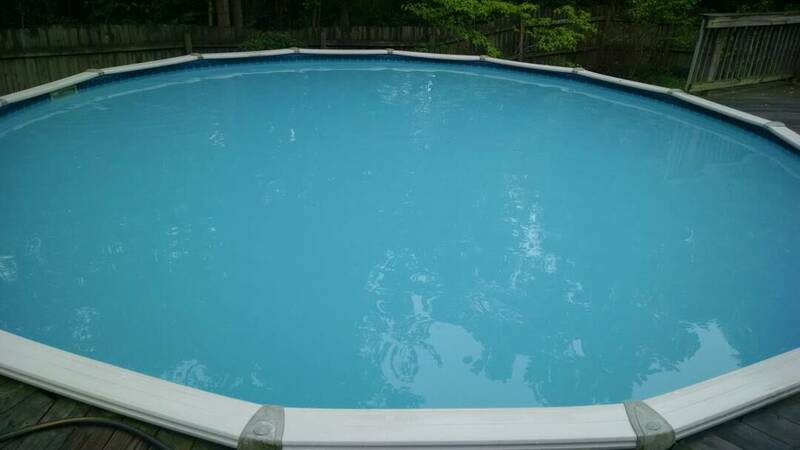 I have cloudy water and am not seeing it clear up - I believe my numbers are in the proper ranges after reading pool school info and have also deep cleaned the sand filter prior to opening. Filter is in good operation - no leaks or broken parts noted. I am unable to pass overnight loss test due to cloudy water. See water results below. And feedback is appreciated - thanks in advance! If your CYA is above 50, you need to be using the 60 CYA value for your SLAM - FC24. pH can't be accurately read above FC10, so for now, all you need to test is the FC until your SLAM is finished - you can ignore the rest of the tests. How long have you been SLAMing? Have you pulled your ladder and checked it for algae (both under the rungs, and inside any ballast, tubes, etc)? Are you running your filter 24 hours a day? Are you brushing the whole pool at least once a day? We'll be able to get you clear. Sometimes the cloudy stage is the hardest to clear up, especially in some above ground pools that don't have as good a filtration system. For now, we need to make sure you've addressed any remaining sources of algae and that you're maintaining the correct SLAM level. Good point. I actually was keeping fc between 22-25. It's been about 2 weeks into the slam although about 1 week since getting to proper cya range. I have not added the ladder and there is no algae in any piping. I hand answered all your questions....Yes I am running the filter 24/7 and have been brushing most days, I could do a better job brushing more. Ok, for now, it's going to be a case of POP - Pool Owner Patience. Keep it at SLAM levels, keep brushing, and keep that filter running. Give it a little more time, make sure you're backwashing when the filter rises 15-20% 25% (thanks Dave) over clean pressure, and take pictures of the pool each day to help us to evaluate if you're making progress. Ok, POP it is - I've been concerned because of not seeing any changes in the water. I will take some pics and post. Normal pressure is about 11 psi. I have been backwashing daily. Wastewater is whiteish when I backwash and clear when I complete. I could be waiting to backwash longer as psi doesn't get a chance to fluctuate very much with daily backwashing. Here is a pic of water this morning. FC measured 23, added enough bleach to bring it to 25 using pool math. I could be waiting to backwash longer as psi doesn't get a chance to fluctuate very much with daily backwashing. Let the pressure increase 15-20% before backwashing. A slightly dirty sand filter filters better. Splitting fine hairs here and I apologize for that. The standard TFP answer for backwash is a 25% increase in psi. mas985 developed that as a point where the efficiency of the pump starts to diminish. When is it safe to get into the pool? Do I need to wait until chlorine level is below 10? I'm waiting for chlorine level to drop more before raising cya. Am I in the right track? I'll add a picture of the pool later today, there is some debris (rocks and remainder or snapper bones) that the vacuum isn't able to pick up - I need to get into the pool to remove them. Thanks for any help on the next steps in advance! FC is below SLAM level for your CYA. Given your current FC/CYA level, I'd stay out until FC falls below 12. Edit - And congrats for passing your SLAM!!!! FC was down to 14 today, that cane down quick! It has been hot and sunny (low 90s in VA today). Hopefully be able to jump in tomorrow and get the floor cleaned up better...how frequently, under normal operation, do you typically have to add bleach? Based on slam process, I'm guessing it will be about daily or every other day. I have a SWG, so I don't add chlorine but think the investment of a few minutes daily to test and measure will be well worth it. You should test and add bleach every day during the summer. Most pools will use 2-4ppm without bather load, which means waiting more than one day will usually put you below minimums.